Taking care of your home is a lot of work. Don’t make it even harder on yourself with furniture that is difficult to maintain, especially if you have young kids or pets who will treat your new carpets and sofa as their canvas or litter box. Here are some tips from Furniture Fair team for making sure that your furniture works with your lifestyle, not against it. Your kids and pets don’t discriminate when it comes to the surfaces on which they decide to wipe their hands, feet, or paws. Opt for wooden or bamboo blinds, instead of fabric drapes that you’ll have to wash because of peanut butter smudges. Our kids and pets are not the only saboteurs of our furniture. Most of us have experienced the difficulty of attempting to remove wine or coffee stains from fabrics, be it clothing or furniture. 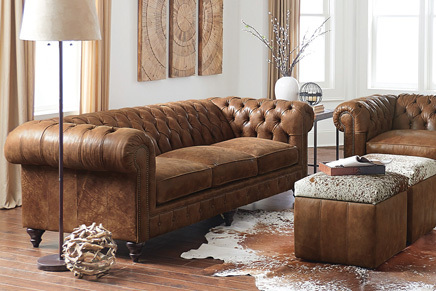 Splurge on that leather sofa, which will age beautifully over time and save you a lot of heartache and fabric cleaner. 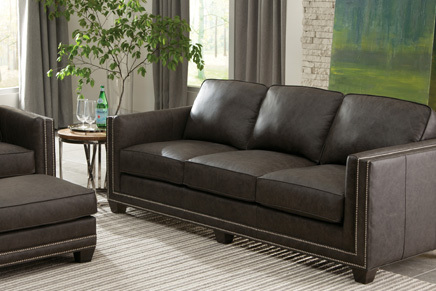 Alternatively, sensuede and vinyl options are relatively durable and easier to clean. If neither of these are valid options, zip-off cushion covers for your sofa can minimize damage and maximize ease of cleaning. We all know that wooden and laminate floors are easier to clean up spills on than carpet, but replacing your floors entirely isn’t always an option. Area rugs are a great addition to any home and can be easily cleaned or replaced, so that spills don’t permanently damage your floors. Replacing an area rug is much less of a hit to your bank account than replacing the carpet in your home. Don’t forget the no-skid pad. Baskets hide everything, including all those stuffed animals and Legos that your kids leave on the floor. They’re perfect for storing miscellaneous toys overnight, especially when you have guests visiting. Leave people wondering how you keep your home so organized. Need help picking the right furniture piece for your lifestyle? Furniture Fair offers complimentary interior design services. Stop in and work with one of our specialists to find the perfect piece for your lifestyle. The post Fab Fabrics appeared first on Cincinnati Furniture || Dayton Furniture || Furniture Fair Blog.